can someone tell how to cut multiple objects out of a photo. If I'm using the lasso tool , when I create a path around the first object , how do I get it to make another path around the second object? Do I have to cut the first one, and then use the original photo and then cut the second object ? 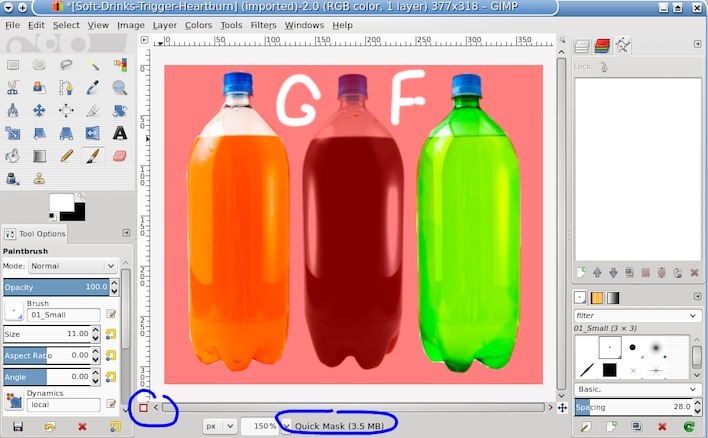 I have a photo with four soft drink bottles I want to edit, and I would like to know what the best way to do this is. (Sep 6, 2014 02:55)JaDan Wrote: can someone tell how to cut multiple objects out of a photo. I assume you are referring to the "Free Select" tool? select the first bottle, then change the selection 'Mode' and select the remainder. It can be used on its own or in conjunction with other selection tools and you paint on the canvas in white to make/add to a selection and black to subtract from a selection. the X key is your friend here which swaps FG/BG colours. I could have chosen a better image as a demo, but I painted in the selections and a freehand GF. Toggle QM off and it looks like this. with left and right bottles selected. Very useful for cleaning up selections made with one of the other tools.